Well with this place you have to stick with what they do well, things like the cheap beer, youngs bitter at �2 a pint, and the carvery. When I went there last week, youngs bitter and the premium ale were not on sale, and the only choice was the Christmas ale. Sat down for a meal and the 2 people I was with took the pie option, bad choice, it was tough and chewy. Nice how they did a discount though. The carvery was excellent, but the gents toilets were cramped and smelled of stale urine. The cook is very good, he has a talent for talking to and engaging customers, do they really do 900 covers on a sunday ? As to having only 1 out of 3 pumps working, well this is a stock problem. My advice is to have the carvery before 6.30, yjen hang round the bar afterwards when it empties out. Be very careful. Ordered a pint, and handed over �10, and only got change from a fiver. After I called out and made a fuss, the barman "found" the extra fiver just by the side of the till, a slight over site ge said. it's nice to go there for the Sunday carvery. The food has been great most of the times i have been there. It can be extremely busy there on Sundays. We had to wait for an hour and a half one time. That didn't bother us as it was sunny outside and I needed a crisp pint. The last few times I have been we have been seated pretty quick. The bar is awfully slow to get served. 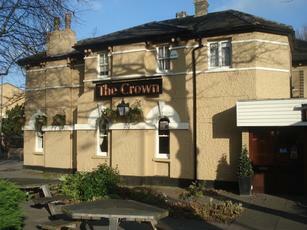 even slower than Lloyds Bar at Bromley south (also called The Richmal Crompton, Why 2 names??) which can be painfully slow even when the place is quiet. If you are eating order your drinks from the waiter as it's a lot quicker. I have noticed that the portion of meat served per meal is a bit more generous lately. I think they have got that right. They can be very slow to replenish the meat and veg when it runs out. i was left waiting for 5/10 minutes while they brought out fresh portions of the meat and veg. On a number of occasions I have noticed that they wait until the supplies get really low before they refill. so i had to make do with scraps of some of the veg. that was a bit annoying. Apart from that it's definitely worth a go. What's great is that there is no washing up. Go there for the food and not for a drink at a pub. As a pub it doesn't have the right atmosphere. You always get an annoying child screaming it's head off all too near. There are always old people moaning about many things. I went there with my dad on one occasion who is in his 70s and he was shocked at the amount of petty remarks. It can get very noisy and it can feel like you are in a Butlins themed restaurant. if it wasn't for the food I don't think I would go there. I haven't tried the bar in the evening so at this time it could be very different. It does some very good ales. Went there on Sunday for a meal with family. Food was nice, you get what you pay for. Waitress Lucy was lovely. The chef carving the meat, Kwame, was an absolute delight! Polite and jovial. I've been to this Toby Inn before and the staff then were obviously only there because they needed the money. They couldn't even be bothered to smile. What a difference this time! Only thing that spoilt the evening : we were waiting to be seated and were sitting just inside the entrance door. I got up to go outside and have a puff of the deadly weed, and went sprawling. When the place was refurbished, some of the floors were at two levels and they have made these into ramps to try and even the floor out a bit. Warning signs were on the side walls, saying "mind the step". Step, what step? It was a ramp! If I'm walking along, I'm looking ahead, not at the walls at the side. Very dangerous, should have a sign suspended from the ceiling. Another customer came over and picked me up. I felt such an idiot, I couldn't wait to get outside as everyone was looking. A member of staff saw the whole thing, but didn't even bother to come over and ask me if I was alright. In hindsight, I should have asked for their accident book to record it. So just be warned, when you walk into this Toby, look at the floor all the time. yes its crap not even decent carvery.waitress kept saying your welcome.....god thats so irritating.